You are here: Home » MEDIA » Books » NASA 1958 Onwards: Operation Manual by David Baker (book review). 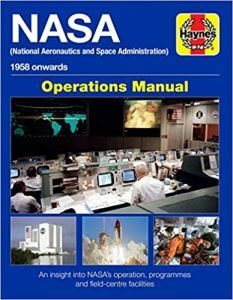 NASA 1958 Onwards: Operation Manual by David Baker (book review). Contrary to the title, ‘NASA 1958 Onwards: Operation Manual’, the USA’s interest in space flight goes back as far as 1915 when they formed a more informal National Advisory Committee For Aeronautics (NACA). It was also the US Navy who took this flying thing that the Wright brothers were doing more seriously. The nature of David Baker’s book is to look at NASA as an organisation. With the other Haynes books where we’ve looked at the various programmes like Mercury, Apollo and the space shuttle, this book looks at who runs them. The first section looks at how NASA developed and then accelerated under the threat of the USSR who achieved space flight with the first Sputnik. It was less about the space flight itself but the range of their missiles that worried the Americans and they had nothing comparable without Wernher von Braun and his team being allowed to work. After that, President John Kennedy’s declaration that they would have a man on the Moon within the decade provided NASA with the needed funds. It’s rather interesting to read there was some element of rhetoric from Kennedy than actual belief it could be done although his successor, Lyndon B. Johnson, ensured it happened and noted here deserves most of the credit. The second section is the largest, looking at 13 of the 17 of facilities that NASA owns spread around the USA for development and testing. Oddly, the Jet Propulsion Laboratory doesn’t actually belong to NASA but is included here. If you thought JPL was a small place, the photos here will assure you it isn’t. They declined to be called the Rocket Propulsion Laboratory because of the public perception associated with Buck Rogers at the time. I wasn’t aware that Cape Canaveral as the main choice for rocket launches was less about being closest to the equator and more to do with it already being used as a missile testing centre before NASA took it over. Unsurprisingly, it also has the biggest entry with 60 pages devoted to looking at all its launch pads. If you’re familiar with the rockets like the Atlas, Titan, Minuteman and Saturn V, including its predecessor numbers, then this book fills in a lot of gaps of just how many were fired and how many were unsuccessful which how the government suits worried about expense. The photographs here include how some of these rockets were put into place on the launch pads. Although it isn’t mentioned, I presume these weren’t fuelled until they were upright. A lot of information comes out as you read. I hadn’t realised that the commercially-made private supply rockets have been sent up from here for instance. The look at the 5 pads that were set up for the Saturn Vs notes that originally that NASA was originally going to send more of them into space than we finally had with 12-15 annually seen as feasible. Originally, astronauts practiced in their spacesuits in local swimming pools before getting their own facilities. It’s only briefly noted that astronauts were having problems originally in space. One presumes it’s the lack of gravity that was tiring. Finally, the statistics about how much NASA costs the American economy is only 0.4% of the federal budget and has repaid it back many times over from all the bi-products like advancing computers, which might be an interesting topic for author David Baker to have a look at. I have a feeling that the proposed Mars mission will pay back its cost even quicker. There is a lot of reading here and a lot of insight. If you’ve picked up all the other Haynes books about the space program then you will need this one for your collection. « Fantasycon 2018 – a report by Pauline Morgan (convention report).